Fellowship In Serving Humanity - F.I.S.H. - delivers emergency food aid to people in need in Anchorage, Alaska, responding to a call for help through a	network of volunteers. Whether at the end of a paycheck, out of work, beset by illness or in a family crisis, many people face difficult times. F.I.S.H. wants to be there for those who find themselves in an emergency needing food. Call F.I.S.H. at (907) 277-0818 for food delivery service if you are in a situation where you are in danger of running out of food and you do not have the money to purchase groceries. An answering service directs your call to a volunteer who will gather information about your family size, children's ages, special dietary needs and an address for delivery. Volunteer packers at the pantry prepare grocery bags to meet the needs of your family. 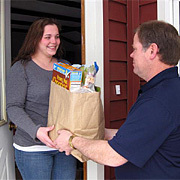 Volunteer drivers pick up the food at the pantry, and deliver it directly to your family the same day you call. Monetary and food donations are always needed and very much welcome. Please contribute. People are at the heart of our organization and we always need more volunteers. Please help.